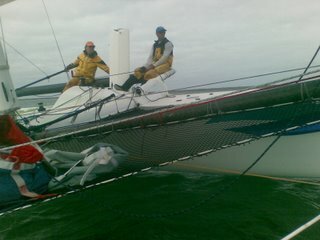 Martyn Riley has won the line honours trophy on his Bloomfield 30 'Raw to the Core' at the 2007 Southern Ocean Multihull Regatta. The Bloomfield 30 has proven its' speed and durability once again at a regatta that experienced conditions from drifters to gale force winds that wiped out over half the fleet. Racing against one of the most competitve multihull fleets in the country the 31' catamaran took out the prize for the fastest boat in the fleet for the second year running, congratulations Martyn!